In our sacramental life we receive grace through practices instituted by Jesus Christ. See the information below to learn more about preparing for the reception of these holy sacraments. Infant Baptism is the first sacrament of initiation for welcoming children into the faith community. The Infant Baptism Team provides preparation to help parents understand the meaning of Baptism and its celebration and offer ways to practice Christian parenting. 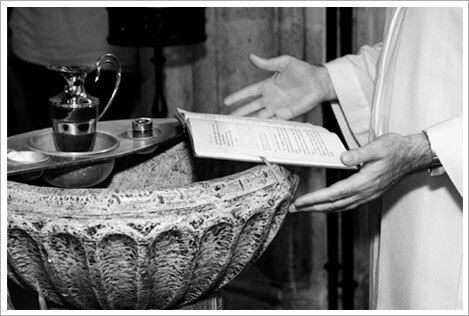 Infant Baptism is celebrated approximately six times a year at our weekend Masses. For more information, contact Carol Frost. Youth Confirmation is a journey by which youth who reach age 16 by the date of confirmation may deepen their spiritual growth and confirm the faith in which they were baptized. The sacrament is offered every year. To prepare, teens participate in monthly sessions, attend a retreat, and contribute ministry and service hours to the community. All teens registered in Confirmation, regardless of school affiliation, are expected to participate in LIFE TEEN. For more information, contact Cathleen Ito. Adult Confirmation is offered to those adults who, for various reasons, have never completed their initiation into the Catholic community by celebrating the Sacrament of Confirmation. Preparation is offered each year through the Reconnect program. For more information, contact Norm Bross. First Reconciliation and Eucharist is offered to children ages 7 and up. Preparation involves both children and parents. All children preparing must be enrolled in parish Faith Formation classes or attend Holy Family Parish School and be registered members of the parish. First Reconciliation is celebrated in December and First Eucharist is celebrated in May. For more information, contact Maria Muscado. Marriage is a covenant by which a man and woman establish a partnership for their whole lives, and which by its very nature is ordered to the well being of the spouses. To appreciate this special vocation, those who are planning to marry at Holy Family must be part of our marriage preparation program. Once you have decided to be married in the Catholic Church, you should contact the parish six months prior to the intended date of marriage. For more information, contact Betsy Staal. RCIA for Children is an ongoing process for children, age 7 to 5th grade, who have not been baptized or have been baptized in another faith tradition and wish to become Catholic. This yearly process provides children with a basic understanding of their faith as well as prepares them for the reception of the Sacraments of Initiation—Baptism, Confirmation and Eucharist. For more information, contact Maria Muscado. RCIA and Sacramental Preparation for Teens is an ongoing process for students in grades 6-12 who are seeking full initiation (Baptism, Confirmation and Eucharist) into the Catholic Church or who have not yet received First Reconciliation or First Eucharist. Teens meet as a small group with a catechist, who prepares them for reception of the sacraments. The group attends LIFE TEEN Masses and dismisses after hearing the Gospel to discuss what they’ve heard. Teens also attend weekly LIFE Nights to aid in their catechetical formation. For more information, contact Cathleen Ito. RCIA of Adults is a process through which non-baptized adults or baptized adults of a different Christian denomination may enter into Full Communion with the Catholic Church. Baptized Catholics who have not received the Sacraments of Eucharist and Confirmation may also join us. You may find this video helpful How Do I Become Catholic? For more information, contact Lee Burch or Norm Bross.